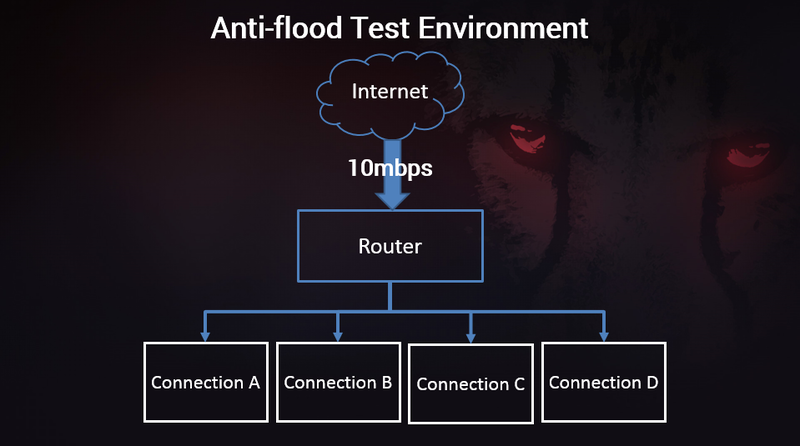 We have developed the world’s first and only anti-spike, anti-jitter and anti-flood technology which solve all of these problems without sacrificing your connection speed. Since our launch in December, Netduma users all over the world have benefited from our Anti-flood feature, which eliminates congestion on your network. In this blog we prove just how far ahead our QoS is of the competition by testing it against world’s best alternative residential router. When someone in your home overuses the bandwidth it’s like rush hour on the roads, everything, no matter how small it is, gets caught in a queue. 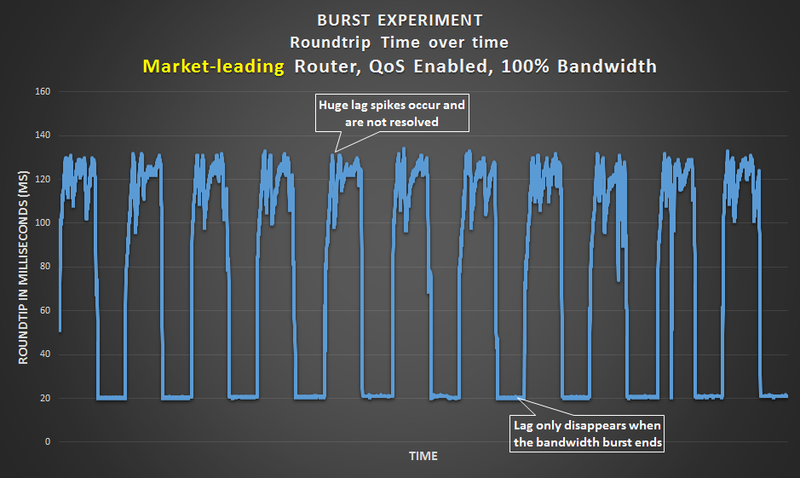 Quality of Service (‘QoS’) tries to remove these queues and has been present on most good routers for the past decade. Our optimised Anti-flood is a huge leap forward as it now delivers complete QoS without any loss in speed. Are you interested? Or perhaps a little sceptical? Let’s get onto the proof. 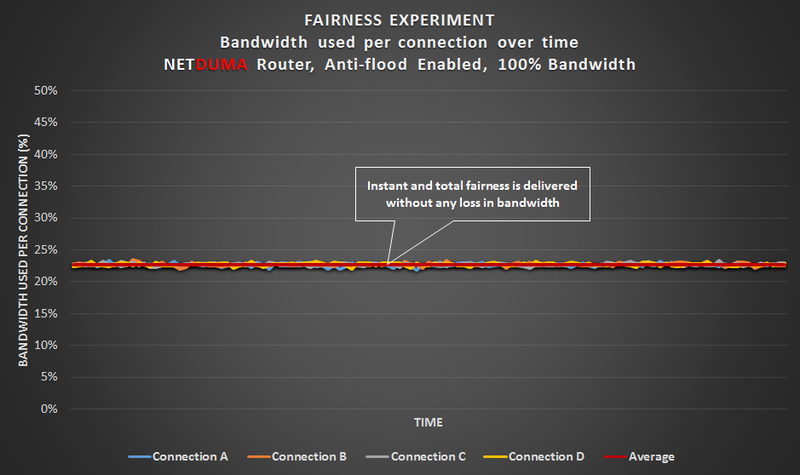 To demonstrate how powerful Anti-flood is, we performed a side-by-side comparison of the NETDUMA against the market-leading router in the world. We have chosen to not name the router as this announcement is not intended to be a direct attack on a competitor. However, we can say that it is widely regarded as the best residential router available and costs around $300. Our first experiment emulates someone downloading a large file, like an HD stream, and the effect it has on your network. 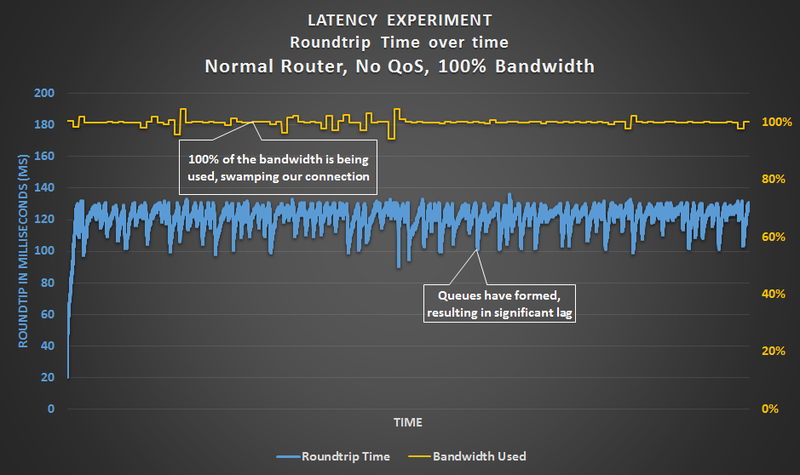 The blue line shows latency, which is often called ‘lag’ (the technical term is ‘roundtrip time‘). 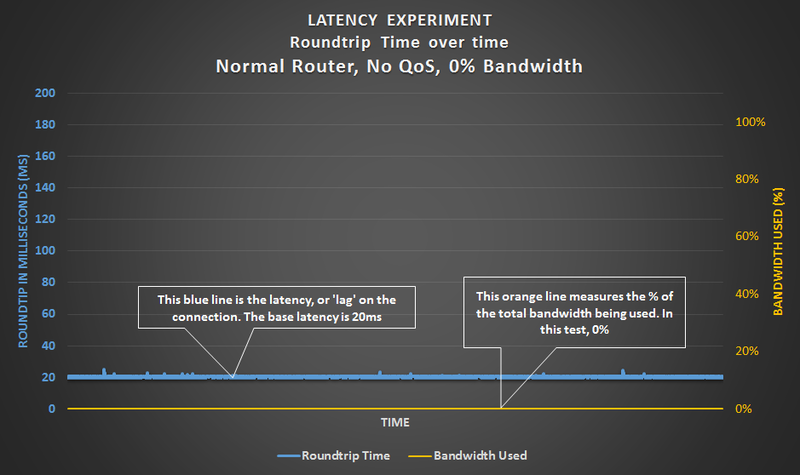 The orange line measures the amount of bandwidth being used. In this first test we can see that over a period of two minutes with no downloading occurring, the base latency of our test environment is 20 milliseconds (‘ms’). This is a good connection and will be similar your home’s connection when your Internet is not being used. 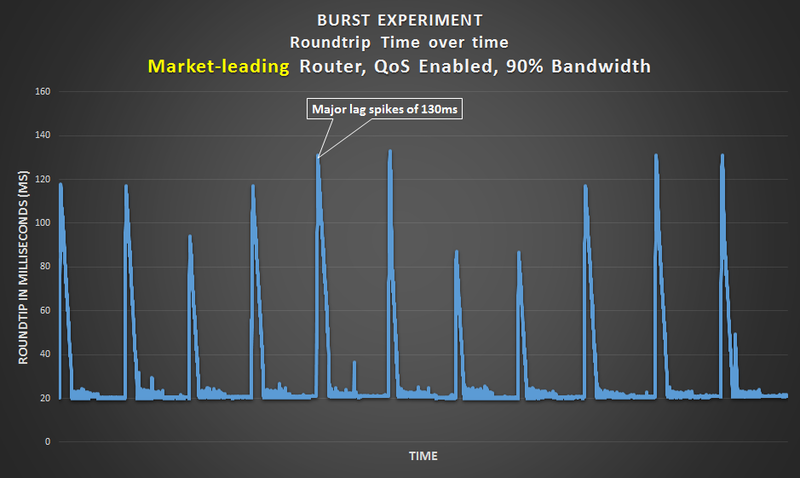 As expected, we have created rush hour on our network, with latency flying up to over 100ms. This is exactly what happens to your connection when someone in your home begins to use all of the bandwidth. 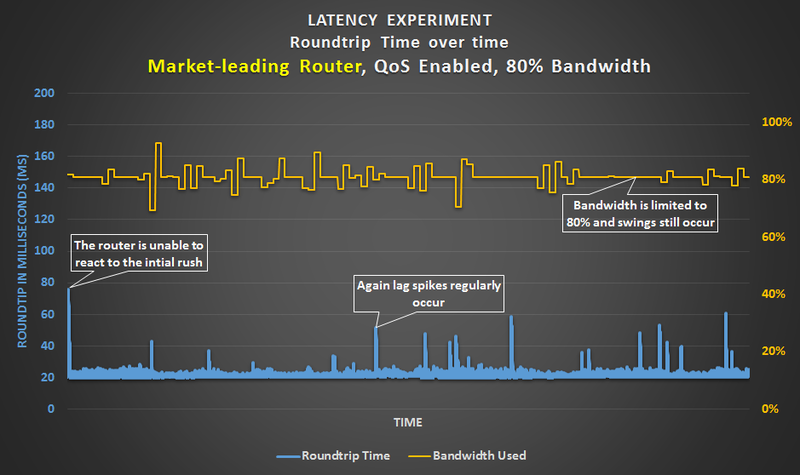 In fact, your latency is probably much higher as it depends on your Internet provider’s tolerance of queues (every provider is different). We have set our provider’s tolerance to a conservative 130ms but tolerances are usually much higher and can be as much as 2, 000ms. Either way, this would be have been a horrible connection for everyone else in the home. So what we can do about this congestion? Can you spot the difference? Don’t worry, we couldn’t either. 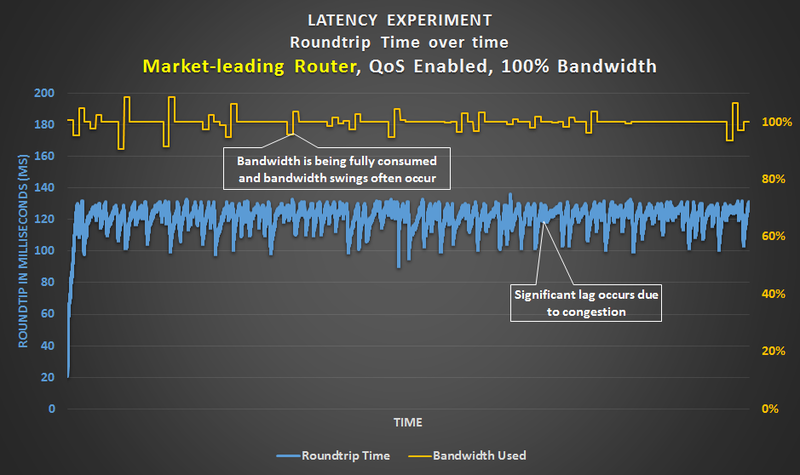 The market-leading router is unable to eliminate congestion when it’s QoS is set to your home’s bandwidth speed. We have been forced to limit our household member’s download. So it’s going to take him or her 10% – 20% longer to complete their download. This not only prolongs the time they’re hogging the bandwidth, but could degrade the quality of their stream / download and may even cause the stream to buffer. This proves that Anti-flood will deliver harmony in your home, allowing everyone to use the Internet without ruining each others’ enjoyment. 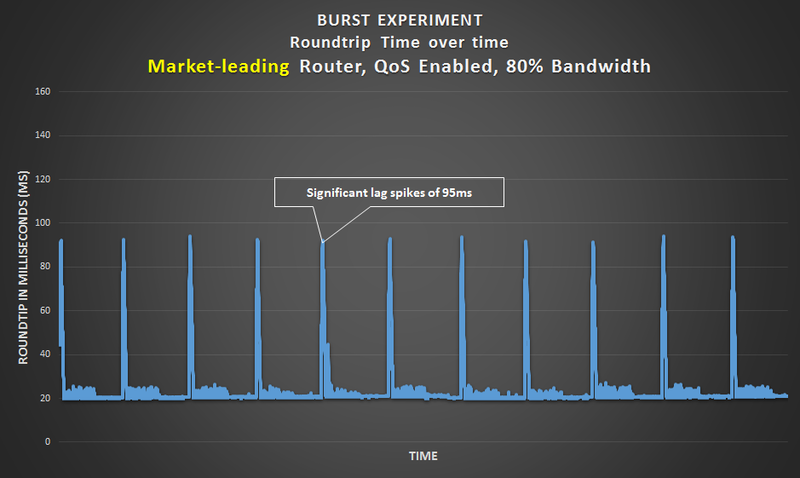 So for our next experiment, we created quick bursts in demand on our network. This is a more accurate representation of a real home than our first experiment, as most of us have many devices and connections using data at different times. 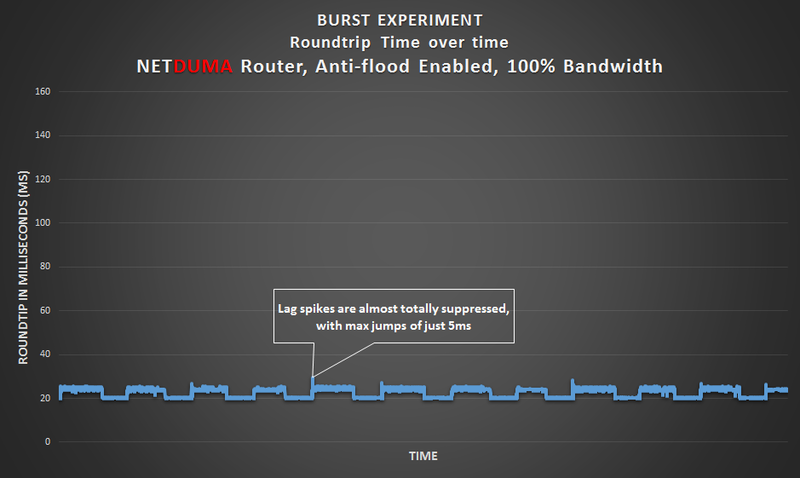 As expected, the bursts cause huge spikes in the connection which only subside when the bursts are turned off. This is creating chaos on our network. 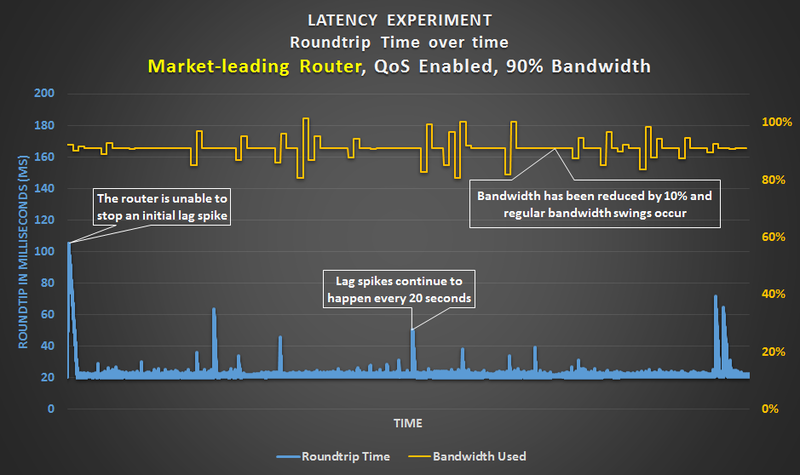 So like in to our first experiment, the market-leading router is useless until a bandwidth limit is applied. But even when we do apply a limit, spikes are not removed as the QoS needs time to take effect. This means that even if you pay for a lot of bandwidth and you have splashed out on the world’s leading router, your network will still experience big spikes whenever demand of any kind is suddenly placed upon your network. So even someone opening a webpage could cause a lag spike for an online gamer. Again the results are outstanding. The bursts are almost completely eradicated, with miniscule spikes of 3ms-5ms. These would not be noticeable to anyone using the connection (to illustrate, it takes a game at 60fps around 17ms to draw a single frame). 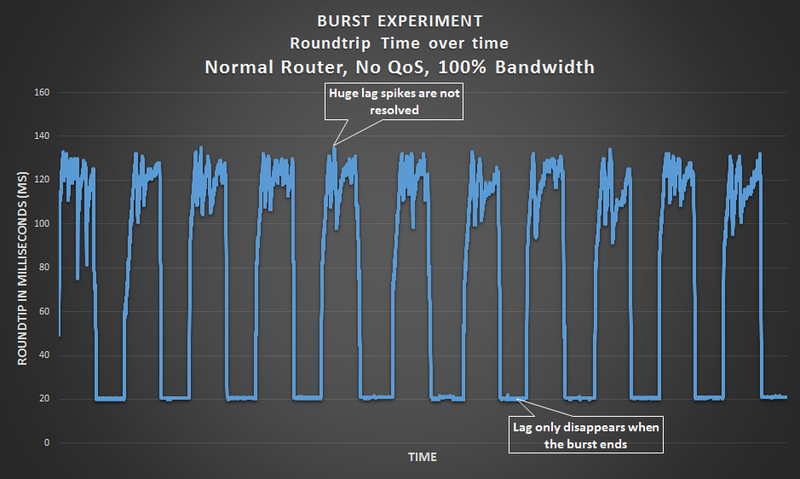 So if you ever experience lag spikes when using the Internet, e.g. gaming, then the new anti-spike and anti-jitter technology will defend against spikes, rendering them negligible. Sidenote: we have delved into the cause of the small 3ms – 5ms increase and we believe it to be an issue with network scheduling. In other words, our software is completely optimised and the bottleneck is occurring elsewhere. 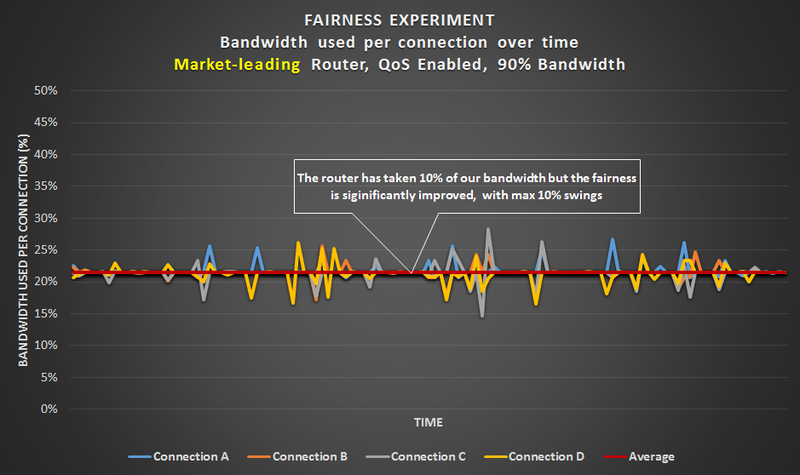 In our final test we measured the Fairness of our connection i.e. how fairly is our bandwidth being shared among several connections? Why does fairness matter? Because if the amount of data each of you is receiving fluctuates, the quality will continuously change as well. This is especially a problem with HD videos where an auto quality setting is enabled. The fairer the allocation, the more consistent each person’s experience will be. Each of the coloured lines represents the amount of bandwidth each connection receives. 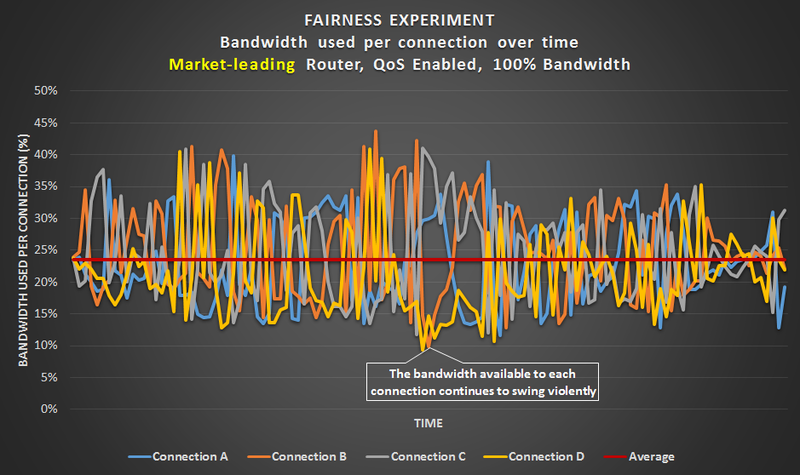 The average, shown by the thick red line running through the middle, is 25% (100% split four ways), but the fairness is chaotic, with swings of 20% occurring as one connection steals bandwidth from another. This would mean each individual’s experience of the Internet would be very patchy. 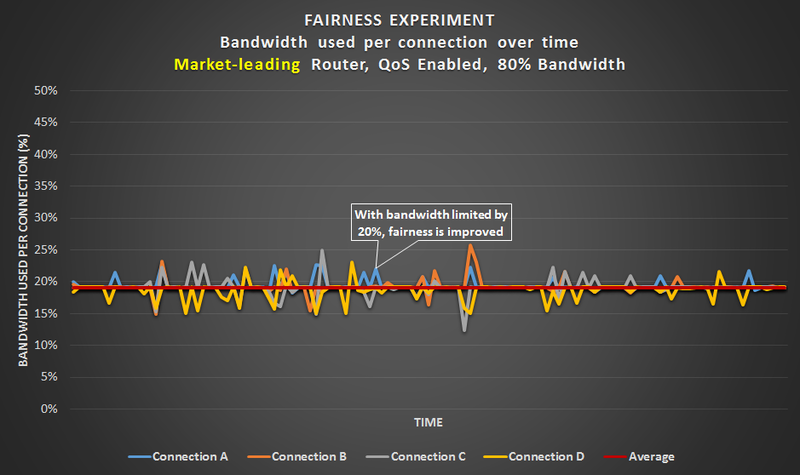 As with the other experiments, the market-leading router is ineffective unless a bandwidth limit is applied and when it is, we are still experiencing 5% – 10% swings between competing connections. 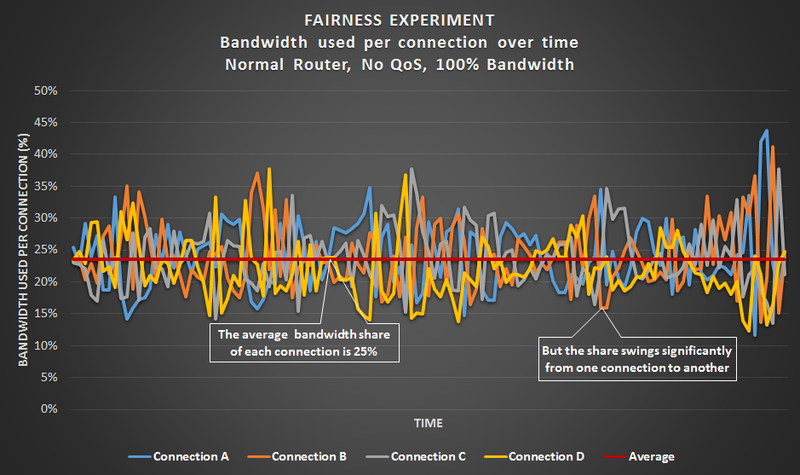 This time there is virtually no deviation from the average, with complete fairness between all of the connections. This means the NETDUMA delivers a continuous experience across every connection, with no one able to steal from anyone else. (Note: If you wished to prioritise one connection over another e.g. a parent’s PC over a child’s laptop, then a separate feature called Device Prioritisation will achieve this). Then NETDUMA’s Anti-flood will make your home network feel as if you have the Internet entirely to yourself by delivering a fair, congestion-free experience without any complicated configuration required. We hope you found this blog interesting. If you would like to discuss this announcement, please do so on our community forum. We are a UK software start-up who launched a revolutionary router in December 2014. We have enjoyed an explosive start, with NETDUMA R1 routers already being used in nearly 60 countries with unanimously positive reviews. We have been nominated for the Nectar Innovation of the Year 2015 and the British Inventors’ Project. I own a NETDUMA already. When will the updated Anti-flood be available to download? We cannot give an exact release date but we are hopeful it will be this Winter. Like all of our upgrades, it will be available as a free upgrade for all of our users. So does this make my connection faster? No, only your ISP can give you more bandwidth. 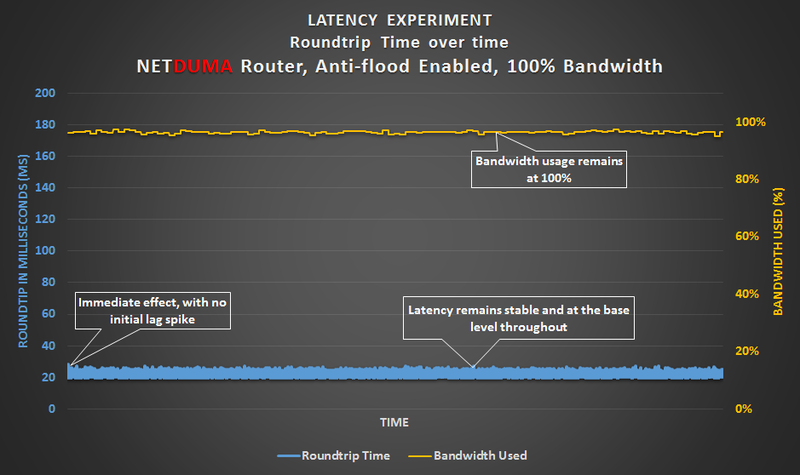 Instead Anti-flood uses the bandwidth that you do have very efficiently. How can I be sure these results are legitimate? In the second appendices below we have described the test environment we used to create the experiments. You can also download the excel model containing our results here. Once our upgrade is released you are more than welcome to replicate our testing. You may also find the demonstration of our current Anti-flood solution helpful. How does Anti-flood actually work? Anti-flood is our intellectual property so we will not be revealing the mechanics of the algorithm. We will however say that it’s completely unique and works in a manner completely different to other routers. Can anything else cause congestion? Yes, another cause of congestion in your home is due to wi-fi interference e.g. wi-fi dropouts or a weak signal. The challenge with this area is there are so many potential causes that there’s no silver bullet. 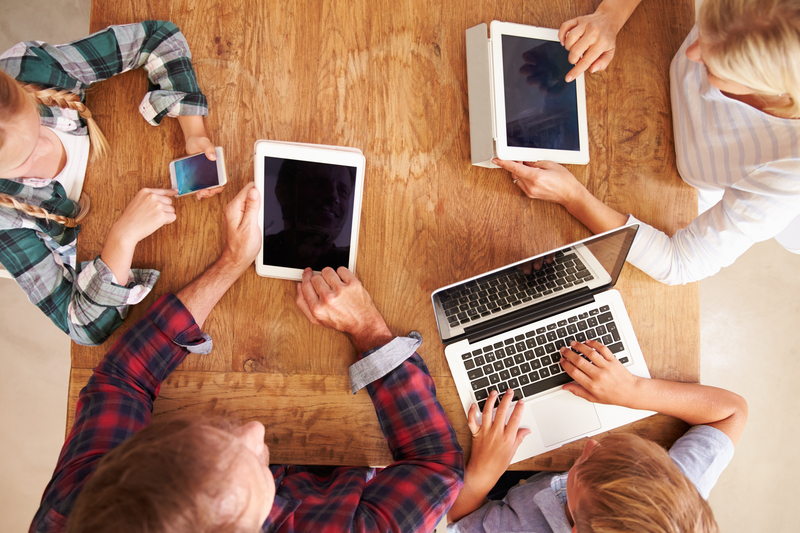 If you have some time to kill, Cisco have published an excellent white paper exploring the many myths of wi-fi interference and why it is such a challenging area to resolve. Ultimately try to ensure your router is not behind an obstruction and if you are a gamer, try to use a wire (Ethernet cable). Powerline adapters are a great solution to allow you to play wired. Will Anti-flood work on upload congestion as well? Yes, absolutely. The results are the same. We have shown only download results in this blog because solving download congestion is an infinitely harder challenge than solving upload congestion. Will this protect me from DDoS attacks? Anti-flood will not, but our VPN-Hybrid and One-click VPN features will prevent it. We created a laboratory to emulate the Internet in a standard home, with Internet being provided by an ISP at a download speed of 10mb per second. This is then distributed around the home by a router. The scale of the graphs is held consistent across each experiment so they are easily comparable. 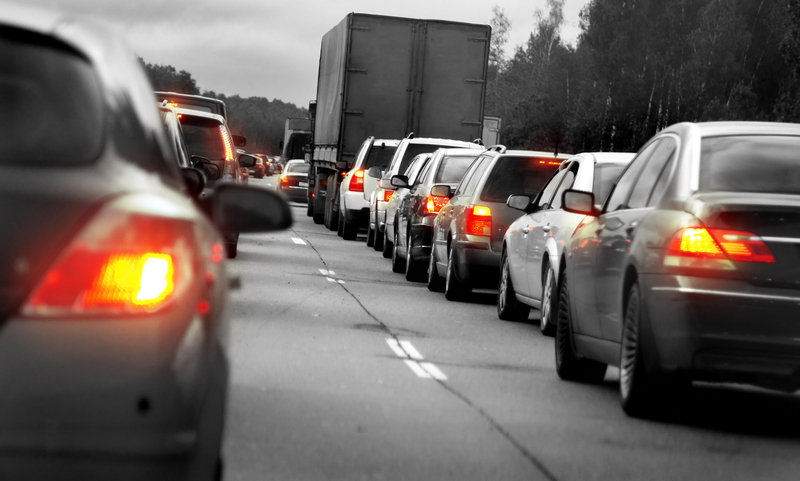 We used iperf to capture the results, with the roundtrip time measured approximately 8, 000 times per test.